Sorry for being MIA the whole of last month. I had my PMP exam on 31st and I’m happy to report that I passed it with flying colours.. Now that I’m back, I have a whole lot of crafts planned for Diwali. 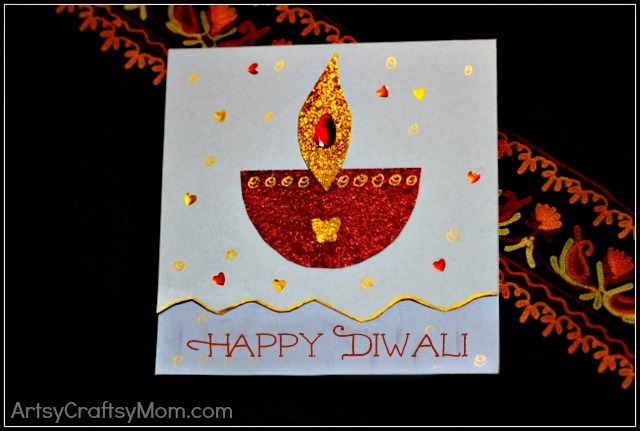 I’m hoping you will all join in with your posts on Diwali decor, Diwali food and Diwali crafts. Today is a very different day.. Lil P is sick with high fever and chills. However, when she takes her medicines she gets really active. 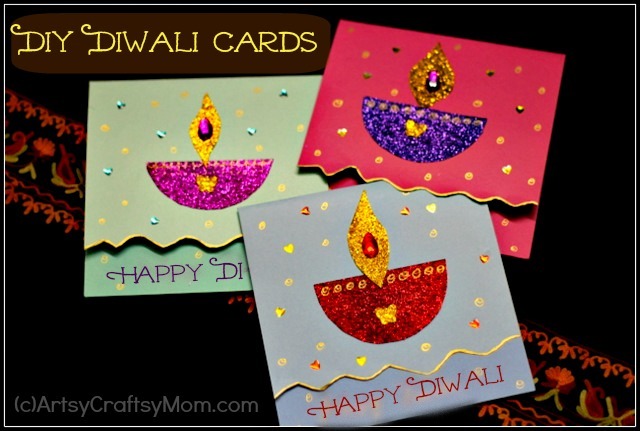 To keep her entertained, we sat at our dining table and made some Diwali cards for her Grand parents & Uncle. I have always loved to make cards and posting them with a handwritten note and I wanted Lil P to feel the same about it. Stick them in the center of the card as shown above. Draw a zigzag design about 1 inch off the bottom. 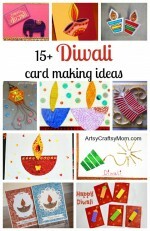 Write Happy Diwali in the bottom and your card is ready. 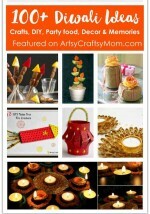 Follow Artsy Craftsy Mom’s board Diwali – Crafts , DIY, Decor, Kids on Pinterest. Very nice Shruti 🙂 Hope LilP feels better soon. 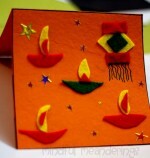 @Roopa – I loved your Diya wreath. will feature it on FB this week 🙂 Can’t wait to see what you come up with this year. @swaram – She is doing better. I’m just hoping that its not something serious. Its just so tough to differentiate between malaria / dengue / common flu for a common person. Hope LilP gets well soon. Hugs. Those look lovely. Hope you had a wonderful diwali! Thanks for this card idea. 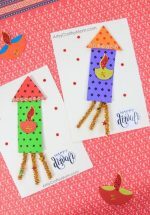 Both my sons made some 10 cards together and gave it for all their school teachers before diwali. I was unable to take the pictures, as we were in a hurry to give it to the teacher’s next day. Really……I love artsy ctaftsy it is really fantastic. I just want to say is there is my project for making greeting card……..and it has helped me so much. Hope u will reply soon. …..